Colorado became a state August 1, 1876, the 38th state admitted to the Union. The mile-high capital of Colorado began as a settlement of gold seekers with 60 raffish cabins and Colorado’s first saloon. But by 1890 its population topped 100,000, nourished by the wealth that poured in from the silver mining districts. 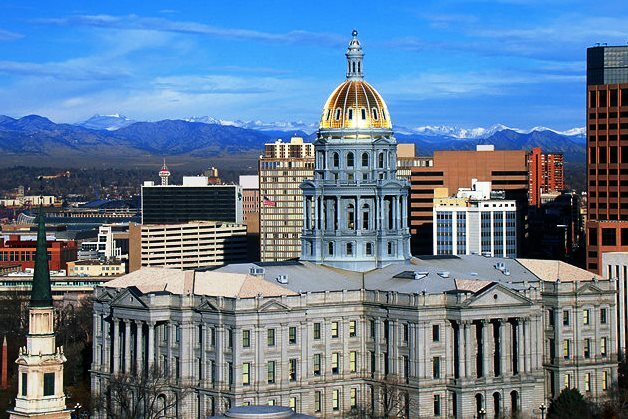 The capitol is built of Colorado granite and its 276-foot dome is covered with gold from Colorado mines. In the History Museum are dioramas of life in settlement times, and full-scale mining equipment. Denver has more than 200 city parks and 27 mountain parks around the city. Red Rocks Park is an amphitheater in a natural setting; City Park is home to the Denver Zoo. The 16th Street Mall is a tree-lined promenade through the center of downtown shopping, served by European-style shuttle buses. Pennies with a “D” come from the Denver division of the United States Mint which began turning out coins in 1862. The liveliness of city life, the highrise buildings topping off the town, the light-rail and the well-laid streets, the charming homes of brick on Capitol Hill, the museums and more museums, the 16th Street Pedestrian Mall, plans for the future taking shape. Mountains near: Rocky Mountains. Mount Elbert, in the central part of the state, is the highest point in Colorado at 14,440 feet.